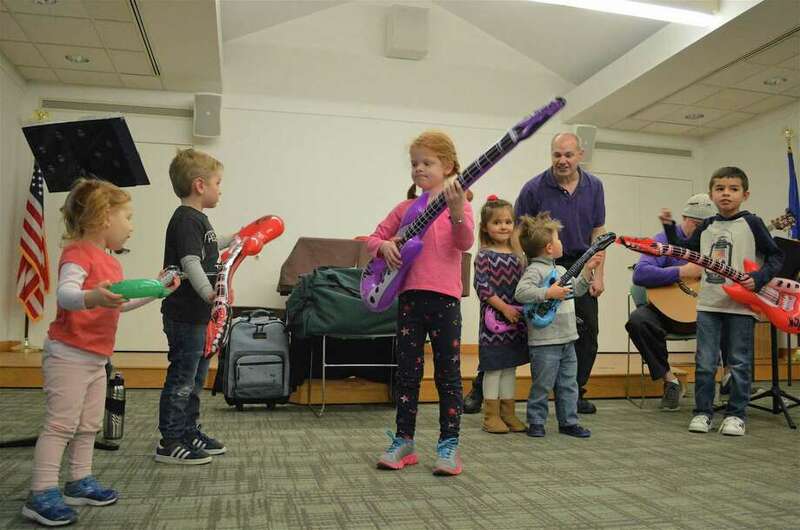 Kids jamming with air-filled guitars at the Weston Public Library's music show with Mr. Joe on Saturday, Feb. 2, 2019, in Weston, Conn.
WESTON — There was a lot to laugh and sing about, and learn as well, when Mr. Joe — aka Joe Rosano, an entertainer from North Haven — came to the Weston Public Library to present a children’s program. “His show is just very energetic,” said Alessandra Petrino, head of children and teen services. Mr. Joe incorporated dance and song, accompanied by guitarist Ron Newhauser, to share ideas about things like brushing teeth and going to the doctor. The show coincided with the celebration of Saturday’s nationwide Take Your Child to the Library Day. “A lot of people still think that libraries are just quiet spaces with books,” Petrino said, noting it can be a very fun and active space to visit as well.